Heavy rains spawned by Hurricane Danny flooded many parts of Charlotte, N.C. Floodwaters rose so quickly in Little Sugar Creek that the underpinnings of a train trestle collapsed, bringing a diesel locomotivecrashing down into the creek. As you might imagine, a 412,000-pound (186,880-kilogram) locomotive is not easily lifted. After the waters receded, emergency teams brought in three large hydraulic truck cranes — one 500-ton, one 300-ton and one 175-ton — to lift the train out of the creek bed and back onto the train tracks. 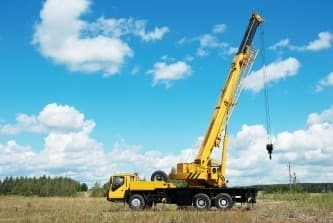 Hydraulic cranes may be simple by design but they can perform Herculean tasks that would otherwise seem impossible. In a matter of minutes, these machines are able to raise multitonbridge beams on highways and heavy equipment in factories and even lift beachfront houses onto pilings. Hydraulic truck cranes are also used to lift killer whales like Shamu out of water tanks when places like SeaWorld ship the whales to new destinations. 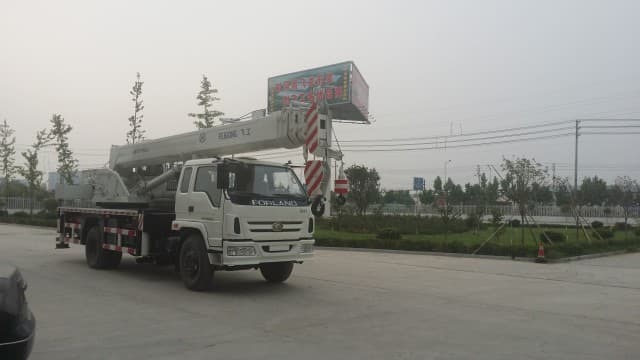 When watching a hydraulic truck crane in action, it’s hard to believe just how much weight it’s moving because it deals with these multiton objects with relative ease. 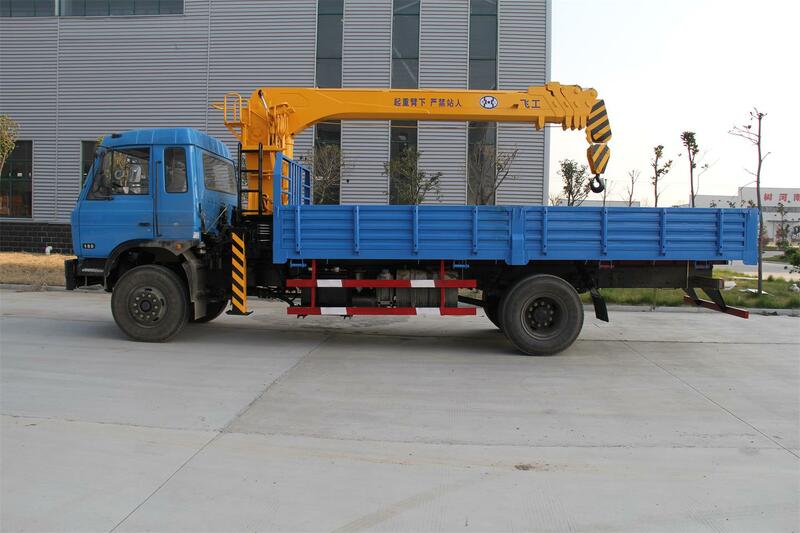 Hydraulic truck cranes vary in lifting power. 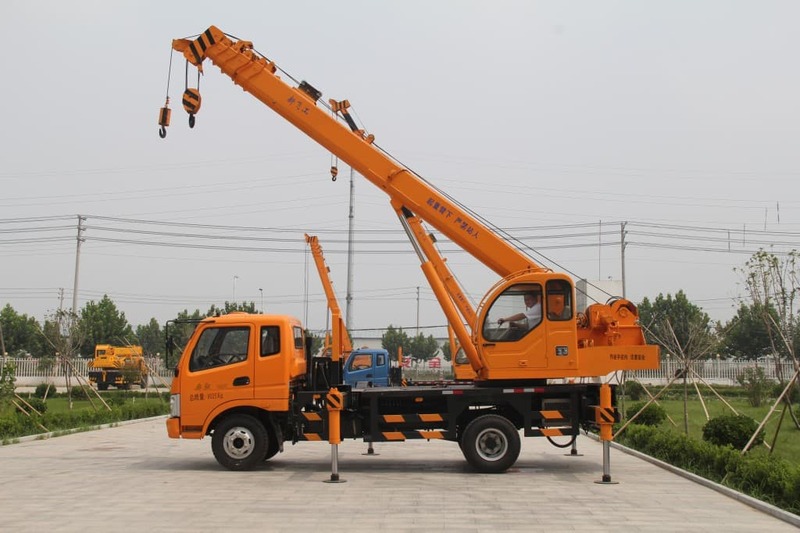 It’s easy to tell how much a particular hydraulic truck crane can lift just by the name of it: A 40-ton crane can lift 40 short tons (80,000 pounds or 36,287 kilograms). Climb into the cab and we’ll show you just how these machines are operated. If you’ve read How Hydraulic Machines Work, you know that the hydraulic crane is based on a simple concept — the transmission of forces from point to point through a fluid. Most hydraulic machines use some sort of incompressible fluid, a fluid that is at its maximum density. Oil is the most commonly used incompressible fluid for hydraulic machines, including hydraulic cranes. In a simple hydraulic system, when a piston pushes down on the oil, the oil transmits all of the original force to another piston, which is driven up. Main pump – This pump operates the piston rod that raises and lowers the boom, as well as the hydraulic telescoping sections that extend the boom. The main pump is able to generate 3,500 pounds per square inch (psi) of pressure. It generates more pressure than the other two pumps because it is responsible for moving much more weight. 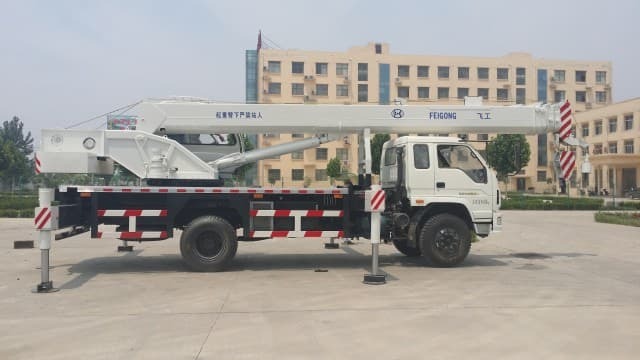 Pilot pressure counterweight pump – A hydraulic truck crane uses counterweights on the back of the cab to keep it from tipping over. These are added and removed by a hydraulic lift that has its own pump. The counterweight gear pump can generate 1,400 psi. Steering/outrigger pump – One pump controls the steering and the outriggers. The outriggers are used to stabilize the truck during lifting operations. Because steering and outrigger operation are not performed simultaneously, they run off of the same pump. This pump generates 1,600 psi. 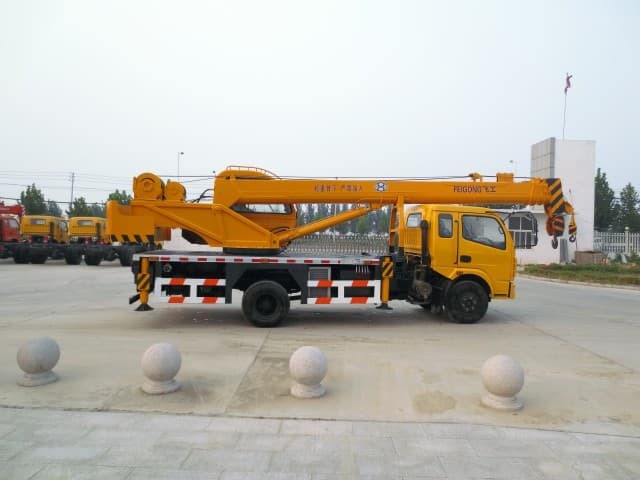 In the next section, you’ll see how the hydraulic system acts on the other parts of the hydraulic truck crane. The most recognizable part of any crane is the boom. This is the steel arm of the crane that holds the load. Rising up from just behind the operator’s cab, the boom is the essential piece of a crane, allowing the machine to raise loads to heights of several dozen feet. Reinforced-steel cable lines run from a winch just behind the operator’s cab, extending up and over the the boom and jib. Each line is capable of holding a maximum load of 14,000 pounds (6,350 kilograms). 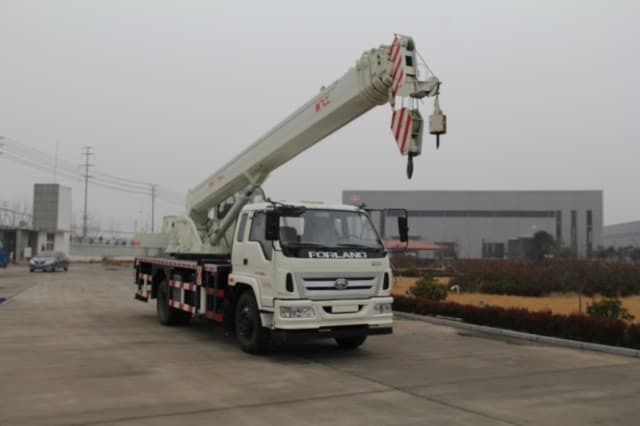 So, a 70-ton hydraulic truck can use up to 10 cable lines for a total of 140,000 pounds (63,503 kilograms), or 70 tons. The lines run up the boom and jib and attach to a 285-pound (129 kilograms) metal ball that keeps the lines pulled taut when no load is attached to the hook. To maneuver the load, the boom has to be able to move right and left, as well as up and down. Underneath the operator’s cab is a Rotex gear on a turntable bearing that turns at 2 revolutions per minute (rpm). It is driven by a bidirectional, hydraulic motor mounted on the cab and housed in a metal cover to prevent injuries. 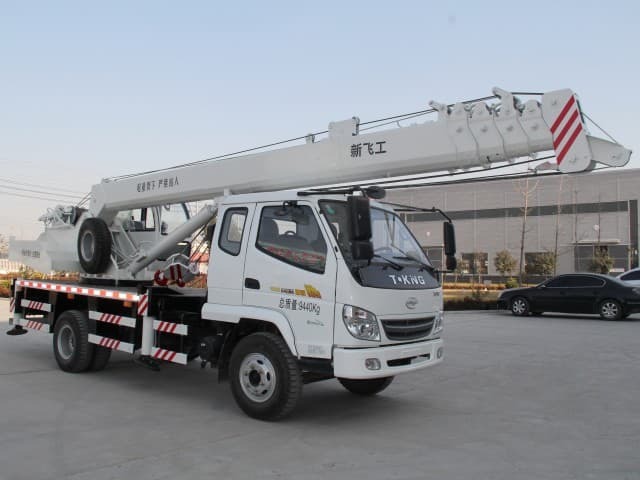 The rotation is controlled by a foot-operated, hydraulic pedal in the cab. 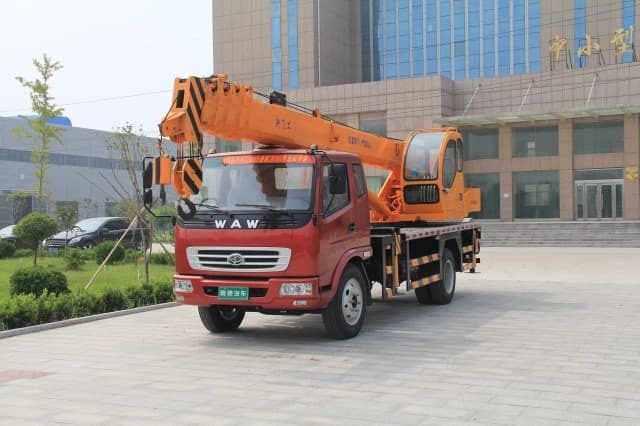 Hydraulic truck cranes are used to lift heavy loads to tall heights, and it’s important that the truck be completely stable during the lifting operation. 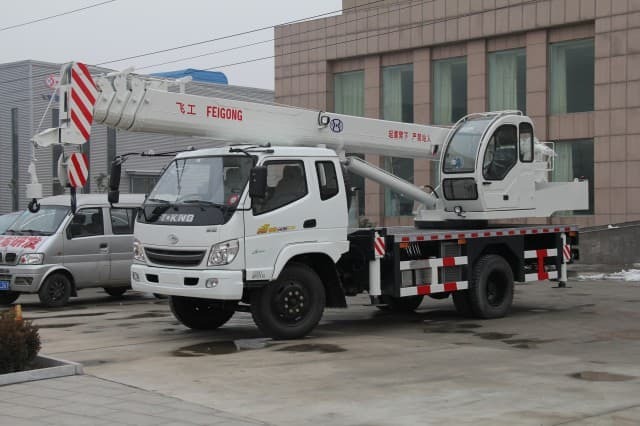 The tires don’t offer the stability needed, so the truck employs outriggers that act as balances to keep the crane from leaning too much to one side or the other. The outriggers use hydraulics to lift the entire truck, tires and all, off the ground. The outriggers are comprised of the beam, which is the leg of the outrigger, and the pad, which is the foot. Sometimes, “floats” are placed under the pad to dissipate the force of the crane and the load over concrete or pavement. Floats are usually wood planks that are lined up to create a base that is larger than the pad itself. The outriggers are only one mechanism used to balance the crane during lifting operations. 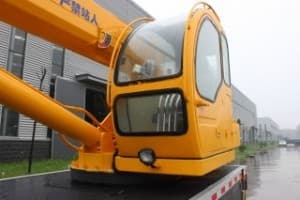 There are also detachable counterweights that can be placed on the back of the crane on the underside of the cab. 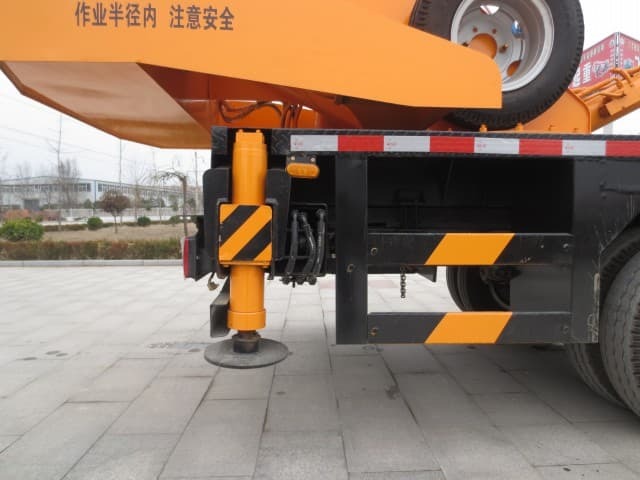 These counterweights prevent the crane from tipping forward during operation. 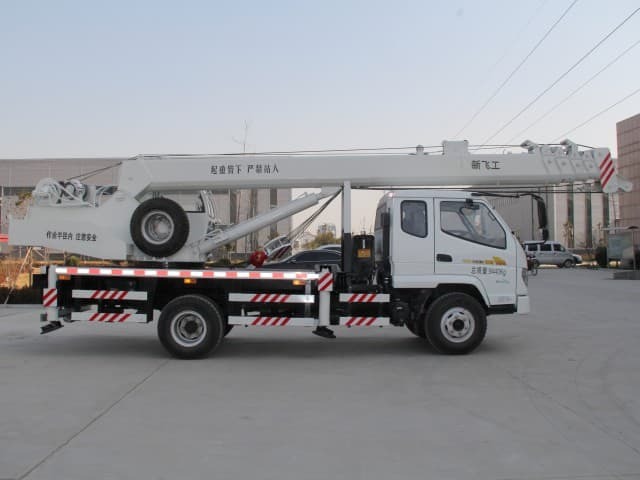 The amount of counterweight needed for a particular lift is determined by the weight of the load, the radius of the boom and the boom’s angle during operation. The 70-ton Link-Belt truck crane has counterweights that come in 4,000-pound (1,814-kilogram) sections. Counterweights are only used during lifts; they have to be removed before the truck can be driven. Joysticks – There are two joysticks in the cab. One controls left-to-right movement of the boom, and the other controls forward and aft movement. Foot pedals – These pedals are responsible for retracting and extending the telescoping sections of the boom. They also control the amount of pressure being generated by the pump. The spool-valve system lets the crane operator controlthe hydraulic pistons. Prior to any lift, the operator enters data into a computer inside the cab, including the weight of the object to be lifted and the height to which it is to be lifted. This computer serves as the operator’s backup, warning the operator if the crane is being pushed beyond its capability. Using a binder of charts in the cab, the operator also determines the angle of lift and the radius of the boom. 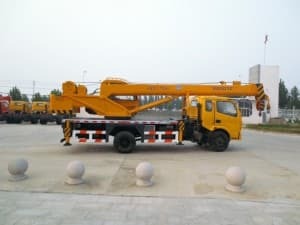 Once all of this is entered, the computer can track the progress of the lift and warn the driver if the crane is nearing its limitations. If the boom is lifted too high for the load amount, a series of lights just above the inside of the front window will begin to light up. These lights are the warning lights for the Load Moment Indicator (LMI). There are at least two other people needed to perform a lift properly, including the oiler and thesignalman. The oiler is responsible for making sure that all of the crane’s parts are in place and secured prior to any lift. He or she also acts as a spotter during a lift to ensure that the lift is being performed properly. The signalman, as the name suggests, gives hand signals to the operator during the lift to make sure the load is being maneuvered correctly. Click here to see some of the hand signals used during a lift.